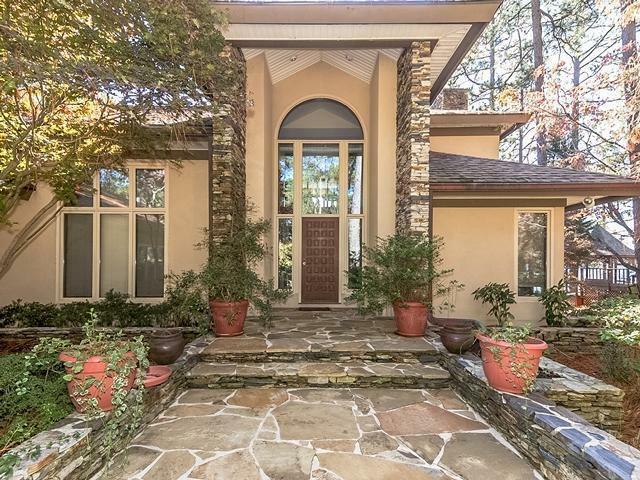 Exquisite home on Lake Pinehurst. Enjoy the sunshine through the two story high windows. Panoramic lake views from the large living room to the second level bedrooms and of course, the kitchen! Carolina stone walkway leads to the grand two story entrance, Enter the large and inviting living area with stacked stone columns and the magnificent stone fireplace. A cozy den is to the right with a wood clad ceiling, the combination living/dining room opens to the covered deck with plenty of room to sit outside and enjoy Lake Pinehurst at its best. The kitchen has an eat-in area and the versatile sunroom off of the master bedroom could be an office or a den. The spacious master bedroom features a large walk-in closet and a bathroom with a whirlpool tub, separate shower and bidet.con't.